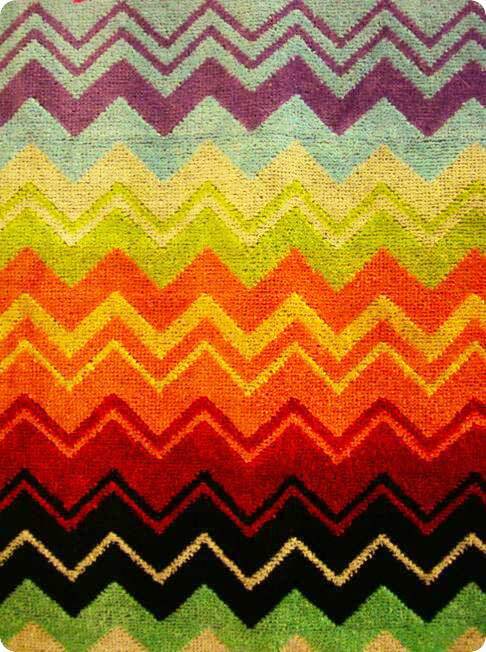 A few days ago, I posted a digital snapshot of my 15 currents fave objects, places and decor inspiration, including a Missoni hand towel. 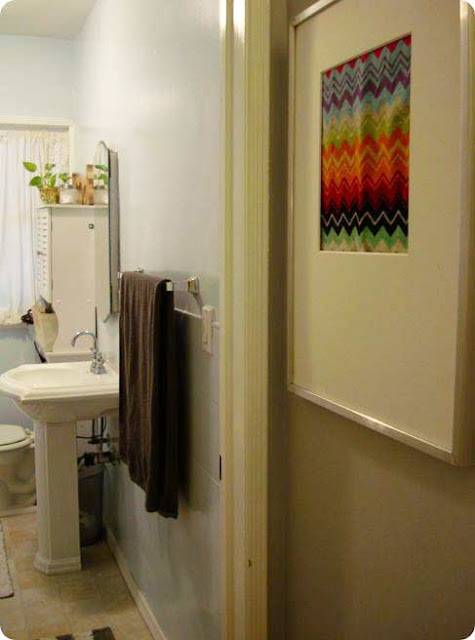 I recently picked up one of these colorful chevron towels for $25. While that is a lot for a towel (at least for me), I thought I could use it for a small space d.i.y. in my home and an affordable piece of artwork. 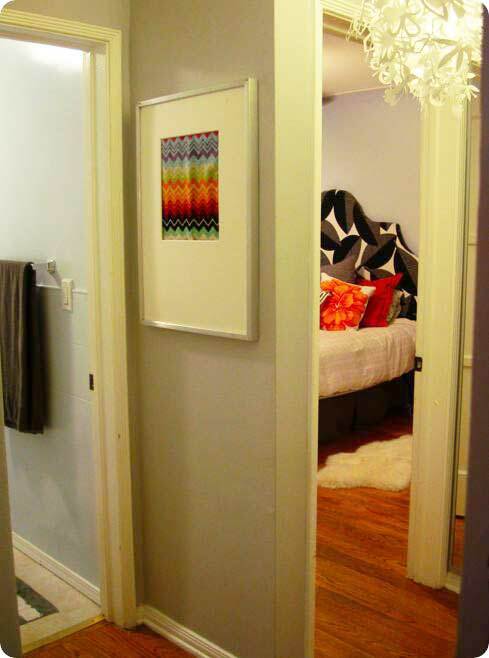 Like my project of framing shoe dustbags, I framed the towel and placed it on a wall in my small hallway that needed a little love. I am really happy with how this came out. I actually got rid of the glass for the frame and just kept it open to allow the texture of the towel to really show. Definitely consider creating inspiration in your home that makes you feel good, makes you smile and simply inspires. There are no rules to decorating your own home - big or small. Make it what you want and enjoy - yes! 9 Responses to "small space d.i.y. How fun ! Looks cute. Such a great idea. I am really loving that towel. Great colors. 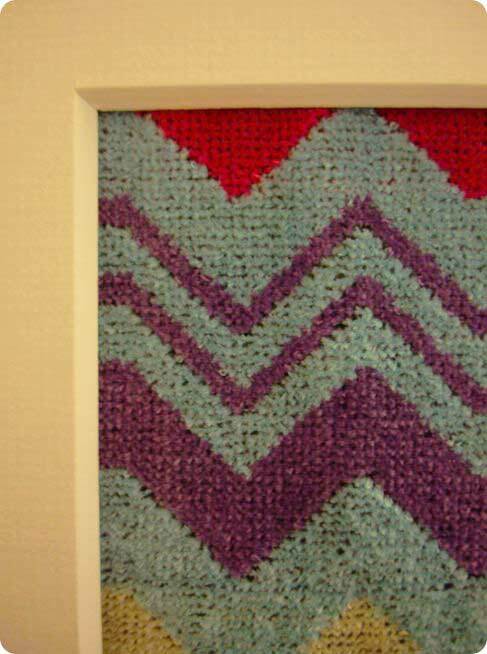 Clever, I thought it was a hand woven cloth at first, but what a surprise, love the colours too. Look very nice, great idea. Thanks, all! Sarah, I wish it was hand-woven cloth - how cool?! Very inspired idea...love your blog :) Condo living in Toronto can get pretty blah and esp with an active baby, im always looking for ways to decorate that won't clog up floorspace! So fun!! Great colours in it!